The Better One Wins! is a compilation album released in Germany in 1992. It includes a number of popular dance tracks by various artists from the early 90s. 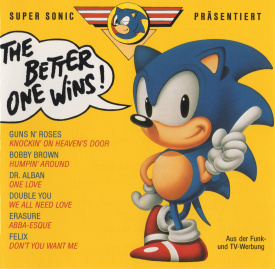 Though Sonic is featured on the packaging, only one song is related to the hedgehog: "Super Sonic Dance Attack" by Inter Galactica Dance Club. This page was last edited on 8 October 2018, at 21:22.